CRAZY DISCOUNT! Was: $299.95 Now: $209.96! 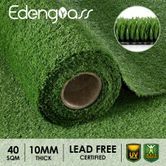 40SQM Artificial Grass Synthetic Turf 10mm 2Mx20M is going to achieve your dream of having a perfect lawn all the year round as well as saving maintenance cost! It is well suited to decorate the gardens, courtyards, roofs, playground, shops and swimming pools. High-density materials and anti-fading yarns mean that our fake lawn has good weather resistance and UV stability. Its bottom is composed of three layers of base cloth with composite grids, ensuring the high draining capability. In addition, after successfully passing UV 3000 hours aging test - simulating whether can keep evergreen in 7-8 years at high sun exposure areas, the lawn is proved to protect against UV degradation to the maximum level. Obviously, the artificial grass is durable and long-lasting. It is reported that synthetic turf with good environmental protection function can guarantee human health at the greatest extent because people maintain close contact with artificial turf every day. That’s why we pay high attention to odorless and non-toxic raw materials, ensuring our healthy grass has no detectable trace of heavy metal and harmful elements. The artificial grass has passed the test and meet the official standard of REACH - The chemical regulation set by European Union. Our synthetic turf is environmentally friendly and of high quality, which is safe to children and pets. Like description. Great condition. 1 incorrect item sent but sorted eventually.